In the holiday of Succot, Jews make a blessing over the Four Species, including a special fruit called the Etrog. The Etrog is similar to a lemon, but it has a different shape and delicious smell. In the past the Etrog was considered a rare fruit, and it could be very expensive. When observant Jews chose an Etrog for the blessing, they looked for a beautiful one, which is called an “Etrog Mehoudar”. There is an old tale about an Etrog dealer who arrives in a small village in Eastern Europe. The habitants of this village wanted to buy beautiful Etrogs to say the blessing, but they were not sure about how to choose a good one. So they would ask the Etrog dealer to give them a beautiful Etrog, and then go ask the Rav if it is really a good one. Then the person would return the Etrog to the dealer, claiming that the Rav said it was not Mehoudar. The Etrog Mehoudar represents our ideals. It is a symbol of perfection, of the satisfaction of all our desires. It is extremely important to have ideals, but we must always remember that we are constrained by the concrete choices we have at a particular moment. It is important to have an Etrog Mehoudar, but when the holiday of Succot starts it is more important to have some Etrog to say the blessing, any Etrog, even if this Etrog is not Mehoudar. If the Etrog Mehoudar is the dream, then the beginning of Succot is the deadline. The goal is to have some Etrog to be able to say the blessing. In the solution proposed by the Rav, the two Etrogs offered by the dealer are the unique concrete choices. The two choices are a limitation, but also part of the solution. At any specific point in time, we must be wise to understand what our concrete choices are, and then select the best one based on our ideals. Software developers are proud of the products they create, and they always want them to be as good as possible. A good piece of software should have many quality attributes: It should be well designed, should be efficient, and should not have bugs. But in our quest of the perfect software, it is easy to miss the deadlines. One symptom of excessive perfectionism in software development is Analysis Paralysis: “The state of over-analyzing (or over-thinking) a situation so that a decision or action is never taken, in effect paralyzing the outcome.” In this case, software developers may spend too much time writing documents and drawing diagrams instead of writing code. A solution to avoid these mistakes is to focus on a product that is both small and has very concrete purposes. This is the idea behind the concept of Minimum Viable Product, proposed by Eric Ries in his book “The Lean Startup”. We are able to identify our concrete choices. We use our ideals to select the best choice. If you celebrate Succot, I wish you a Chag Sameach! This entry was posted in Efficacy, Jewish Sources and tagged Efficacy, Jewish. Bookmark the permalink. the pursue of perfection is a difficult task..but the way you presented with the ETROG solution you made it simple and understandable….CONGRATULATIONS for your imagery and creativity, Hayim. All good points. Chag samach! 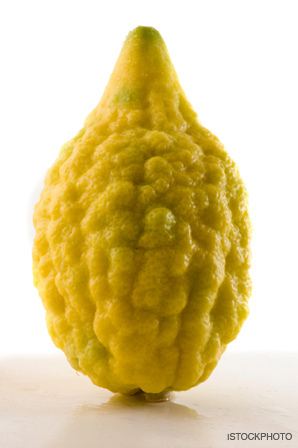 You need to be careful not to “underdo” your thinking otherwise you will end up with a lemon, which looks like a Etrog Mehoudar but will not do as one of the 4 Sukkoth species. Thanks, Avri! Indeed, this a common mistake: To adopt a simplistic solution instead of a simple solution.